All "red" layflat hoses on the market are not the same. 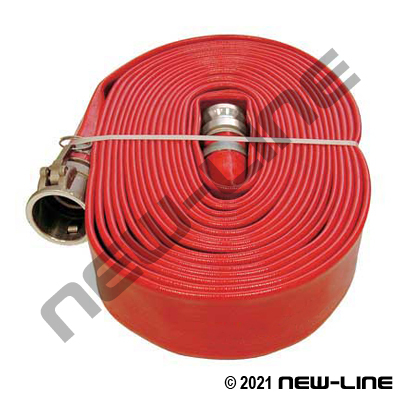 The NL2425 Red PVC Spiraflex has a thicker wall (for added durability) and a higher working pressure than other "red" PVC discharge hoses commonly seen on construction sites or rental yards. THIS HOSE IS NOT RECOMMENDED for applications such as high volume water transfer, pressure pumping water over a distance, washdown, drinking/potable water or where there is excessive abrasion, dragging or external abuse. It is lightweight, mildew and rot resistant, and has a flame resistant cover that meets MSHA 2G-14C/16 approval. Typical Fittings: Camlocks, N310-AL short shanks, forestry or threaded fire hose expansion ends, N52 punch clamps. Construction: Spiral and longitudinal wrapped polyester yarn, embedded and coated with PVC. Detail Comments: For other sizes please refer to our NL2420 Red SF-50 PVC Layflat.